The secret to using the energy industry for building a power portfolio isn't really a secret. The energy industry can a be very lucrative segment of the stock market to invest in, and there are lots of companies in the space that have steadily outpaced the broader market for years. What trips up so many investors in this space, though, is that it's a cyclical industry, and very few people know how to handle cycles well. So, to help you beat the cyclical nature of the business, here are three tips on how to handle the energy sector better. The energy industry is riddled with various distractions. Constantly changing oil and gas prices are shoved in our face on a daily basis, as well as a dozen articles that each claim to know where prices are headed in the future. All of this media normally plays off the exuberance in high price environments, or the doom that will consume us all when oil and gas are cheap. If it's not an oil and gas story, then it's one about how alternative energy companies will struggle to continue their success once federal tax credits expire. Or that the entire world needs to look at what China's energy policy will be over the next few years to see the future of the investment landscape. Sure, using this sort of information to drive your investment thesis might pan out over a rather short time frame, but the chances of it fully working out as you planned are just as good as that plan going bust. So, rather than getting caught up in the daily noise of the stock market, try to remember this to keep things in perspective: Over the next 25 years, increasing population and a growing middle class mean we will increase our energy consumption by 37%, and that is while achieving very ambitious energy conservation targets. To meet that burgeoning demand, oil and gas consumption will grow by 0.8% and 1.6% annually, respectively, and the percentage of total energy generated by wind and solar is expected to more than quadruple over this time frame. There is lots of demand to be satisfied, and just about every type of energy will be needed to get there, regardless of what the crisis du jour is. This sounds like a daunting task, but it's not as hard as it might seem. Great companies that have routinely beaten the broader stock market coming from the oil and gas space have a couple of traits in common: They generate cash flow from operations in excess of their capital expenditures on a pretty regular basis, and they use that excess to reward shareholders. NOV Total Return Price data by YCharts. For other energy industries, such as solar and wind, there aren't really that many companies out there with the types of histories oil and gas companies have. 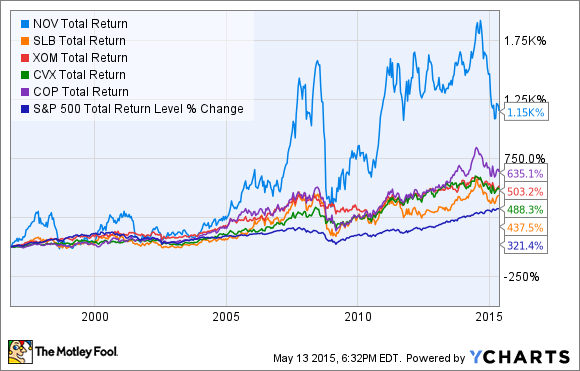 Then again, solar and wind have only become attractive investments relatively recently. In the past five years alone, the cost per unit of energy produced by a photo-voltaic solar panel has declined by 60%, and the economics of larger-scale solar- and wind-generation projects are on par with conventional fossil fuel power plants in more and more parts of the world. As these energy sources mature, companies with the capacity to generate cash over long periods will emerge, and they will have the potential to post market-beating returns -- much like oil and gas companies have for years. Energy is a commodity just like every other commodity. It goes through cycles of oversupply, waning demand, shortages, and every other market dynamic in between. Because of this, share prices will fluctuate with the overall attitude of the market. There is an excessive amount of information trying to tell us why this commodity cycle is different than every other one we have experienced in the past. These siren songs bait us into investing generously just before the market turns south, then wait until a rebound begins before telling you to sell. All the while, investors who simply kept investing through the ups and the downs do far better. That's not to say it's easy to invest like this. Go back and look at that stock chart up there. Even most roller-coaster fanatics don't have the stomach to ride out those ups and downs without losing their lunch. Many of us have made the mistake of buying an energy stock during a boom, only to turn around and sell it when times hit rock-bottom. However, hopefully we can learn from our mistakes and use them as reminders to keep steady the course -- even in the roughest of seas. Warren Buffett has said there are two things that make a successful investors: temperament and time. Stay focused on the trends the energy industry will encounter over the next several decades. Select a basket of companies with a history of cash generation -- or those with the foundation to generate cash in some of the emerging energy sectors. Stick with them through the ups and downs of the commodity cycle. If you can do those things, you could very well be on your way to building wealth over the long term in the stock market.